North Palm Beach, Fla.–Acclaimed golf course designer Jack Nicklaus–known for his record 18 professional major championship victories in addition to his global portfolio of award-winning courses and host venues for the game’s most significant events–once famously said, “The game is meant to be fun.” And now, the Nicklaus Companies is upping the ante to an all-new level, with the launch of Jack Nicklaus Perfect Golf, the most realistic golf computer game the market has ever seen. Golfers, non-golfers and gaming enthusiasts alike will have hours of enjoyment designing and playing golf courses just like the Golden Bear himself has done for the last 50 years. Jack Nicklaus Perfect Golf features an integrated online multiplayer with an in-game lobby for matchmaking. The game includes a fully integrated tournament function that allows external community sites to host their own tournaments in-game, using the publically available Application Program Interface. There is also an Integrated Control API, which can be used to connect external equipment to the game to provide a vast array of different simulation options. The physics engine, built specifically for golf, implements true skid and roll bounce physics, as well as accurate green speed measurements. 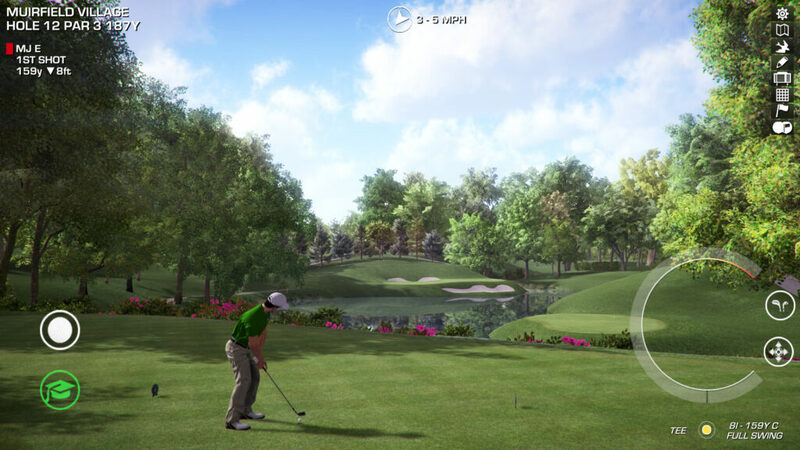 Inside the game, users can select different swing mechanics, including full controller support; various time-of-day and weather options, including real-time integrated weather; customize their players and golf clubs; and select from multiple difficulty options to play the courses they’ve designed. There are more than 20 modes of play, including the innovative hazard golf and a fully customizable Method of Play Creator, containing over 50 events that can be used to create custom game play modes. Jack Nicklaus Perfect Golf also gives players a completely customizable experience, bringing forth the expertise that Jack Nicklaus and world-leading Nicklaus Design have gleaned from designing nearly 400 golf courses worldwide over parts of six decades. Now, users can become expert golf course designers and architects too. Nicklaus Design Course Forge, the in-game course designer, is the same platform used internally by Nicklaus Design for its global projects. Not only can players dabble in golf course design–they can completely customize the surrounding landscape, selecting from a large array of camera angles, tracers, and graphics quality settings. The courses are also fully geo-referenced for future integration of real-world data and accurate sun angles, based on location. Perfect Golf is a sport technology venture specializing in advanced virtual 3D Games, Broadcast Technologies and simulation. All of Perfect Golf’s software products–including Terrain ForgeTM, Course ForgeTM, Broadcast SuiteTM, and now Jack Nicklaus Perfect Golf–incorporate fully geo-referenced terrains and create a seamless environment between reality and virtual reality for the sports enthusiast. As the consumer and commercial markets surrounding broadcasting, gaming and mobile continue to battle for user time, Perfect Golf is leading the push to integrate these three platforms into a single experience that will bring the user closer to the action and much more integrated into it. The future of sports simulation is not just in making the experience more realistic, it is in making the user an integrated part of it and empowering users to compete against the professionals that are on television at their gaming console, PC or mobile device. Further, Perfect Golf is currently developing real-world technologies, such as GPS Golf Ball design, which can be fully integrated to the existing suite of products, and provide users with both quantitative data and their own qualitative 3D Broadcast SuiteTM for social media and re-integration back into the game via cloud-based technologies. Perfect Golf, Inc. is incorporated in Delaware, with headquarters in Buffalo, NY, and satellite office locations in Washington, DC, and Manchester, England. For investment, shareholder information, or more information, please visit www.perfect.golf. Products and services include golf-course design, development of golf and real estate communities, and the marketing and licensing of golf products and services. Nicklaus-branded products have been marketed worldwide since 1962. The Jack Nicklaus and Golden Bear-branded lifestyle collection of products include: golf academies; ice cream; restaurants; beverages; wine; home appliances; flooring; cabinets; apparel; footwear; and golf equipment.